Parliament has just voted to re-examine the clause in the constitution that prohibits arbitrary deprivation of property. This was introduced by President Cyril Ramaphosa, who was also the one who oversaw the drafting of the constitution in the first place, so he should know what he’s doing. I have certain misgivings about this, because the arbitrary deprivation of property that that clause in the constitution prohibits was one of the features of the National Party government from 1948 to 1994, and that is the kind of behaviour that that clause of the constitution is explicitly designed to prohibit. In the ethnic cleansing that took place under the apartheid policy of the National Party government, thousands of people were arbitrarily deprived of property with little or no compensation. Part of the intention of this clause in the constitution has also been to allow the government to make restitution for those who were arbitrarily deprived of property in the past, and that process has been slow and cumbersome and badly managed. Changing the constitution on this point, we are told, bill improve this process. But will it? Back in the 1960s I was a member of the Liberal Party, which was hated by the National Party because of this very issue. The NP regime expropriated land owned by people who belonged to the “wrong” ethnic group for a particular area, and wanted to do so with little or no compensation. The Liberal Party opposed this policy and helped many people who were so deprived to take cases to court to obtain better compensation. This, of course, made the ethnic cleansing exercise more expensive, and thus slowed it down. One example was Khumalosville in Natal, where black people lived on two-acre plots where they kept a few cattle. Khumalosville was declared a “white” area, so the people who lived there were forced to move to Hobsland. They were offered R42.00 in compensation for their two acres in Khumalosville, and were given a “free” half-acre plot in Hobsland, with the option of buying an additional half acre for R110.00. But even if they did pay the extra to have half the land they had previously owned, the smaller plots would not support the same number of animals. Twenty-two years after the present constitution came into force, have the people of Hobland had restitution of their land in Khumalosville? I have no idea, and many of them are probably dead by now, and their descendants have probably moved away, and no longer have the animals nor the desire to keep them. Expropriation without compensation will not help them, but it will facilitate the kind of abuse that they suffered under the National Party regime. Of course the ANC will not do this, and we must trust them not to do that kind of thing even when they want to give themselves the power to do so. But nine years under the Zuptas have shown that no government can be trusted. Put not your trust in princes nor in any child of man, for there is no help in them. The news of the death of Pete Seeger was not surprising, but was sad nonetheless. since he was one of the first singers I ever became a fan of, though at first I never even knew his name. When I was younger we lived on a smallholding at Sunningdale, just outside Johannesburg (the bit where we lived it has now been absorbed by the megalopolis, and has another name). Because it was outside the municipal area, there was no mains electricity or water, and so any music and records we played we heard on an old wind-up gramophone. My parents had about 10 records, and the only ones I can remember were Ravel’s Bolero on a 12″ 78 record, and two 10″ ones with songs — Rum and Coca-Cola by the Andrews Sisters, and Old Paint by The Weavers. I used to ride horses a lot in those days, and when I was about 11 or 12 years old I used to ride around singing Old Paint because I knew it was about a horse, even though I didn’t understand some of the words, like coulees, draw and hoolihan. I didn’t know then that Pete Seeger was one of the Weavers, but ten years later I certainly did, when I was a student in the 1960s, and in a way his were the songs that shaped our generation. My mother worked for SARRAL, the South African Recording Rights Association, which kept track of musicians’ royalties, and then she was headhunted by Teal Records, who wanted her to sort out their copyright department, which was a mess. They used to get all sorts of samples from overseas record distributers, and Teal would decide whether to import them, or, if they were likely to be popular, to press and distribute them locally. My mother picked up quite a lot of these samples, especially the ones that weren’t distibuted in South Africa. 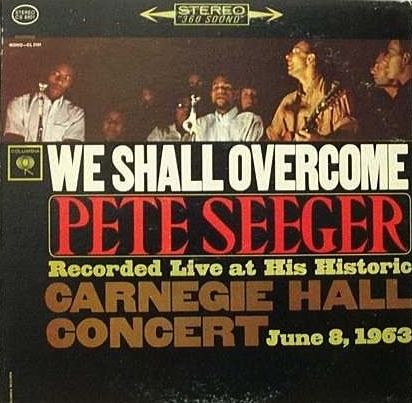 Pete Seeger’s We shall overcome album was one that was not distributed, not because Teal thought it wouldn’t sell, but because the Publications Control Board immediately banned it. My mother nicked the sample copy and brought it home. By that time we lived in Johannesburg, had mains electricity, and so had upgraded our wind-up gramophone to an electric one that could play LPs. And we played it so much that it almost wore out. And thirty-five years years later, when our kids were about the same age as I was when I used to sing Old Paint they had most of the songs on the record word perfect, right down to the accent — “what was going on in Birmingham, with the daags….” and breaking into I ain’t scared of your jail ’cause I want my freedom, I want my freedom now. Pete Seeger taught us to express our desire for freedom in song. May his memory be eternal! Today Google celebrates the 129th birthday of Rorschach, the Swiss Freudian psychiatrist best known for his inkblot test where people are asked what they see in the inkblot that is shown to them. via Cherie\’s Place » The Hermann Rorschach Google Doodle. Well, it was yesterday, actually, but I found it rather interesting. So what does it make you think of? It took me back 50 years to the passing of the 90-day detention Act, and clearly depicts two Special Branch men taking someone in for 90 days. I’ve seen claims on some web sites and postings on Facebook and other social media sites of huge numbers of Christian martyrs in the 21st century, usually without anything to substantiate the numbers claimed. John Allen, author of The Global War on Christians , explained that martyrdom referred to “a situation of witness”. A martyr is not just someone who is killed for holding Christian beliefs; it can be someone who is killed because their beliefs prompt them to acts of moral courage that put them in danger. Allen gives the example of a woman killed in Congo for persuading young people not to join to militias, which is fair enough – but it’s difficult to see how this can be extrapolated to all Christian victims of the war. According to Bartholomew’s article, the inflated figures are arrived at by counting all Christian war casualties as martyrs, in such conflicts as the Congo civil war. It’s not just the inflated figures that disturb me, however, but it’s rather the whinging attitude that seems to lie behind them. There were probably more Christian martyrs in the 20th century than in any other century in history. That was because there were ideologies like Bolshevism that promoted atheism, and persecuted not only Christians, but Jews, Muslims and Buddhists as well. 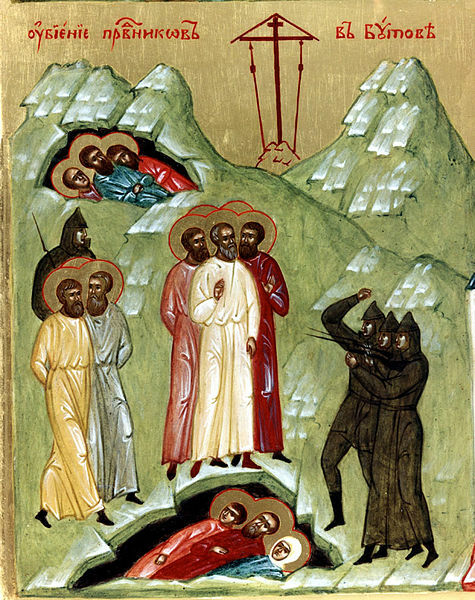 Many Christians died in such events as the Butovo Massacres, and the Russian Orthodox Church has been going through the historical records and documenting as many instances as possible. Closer to home there were the martyrs of Epinga in Namibia, whose story both state and church tried to suppress. Many Christians have died as martyrs in the current civil war in Syria, and in other 21st-century conflicts in the region, xso there have been many Christian martyrs in the 21st century, though probably not as many as some have claimed. I can think of two good reasons for publicising martyrdom, one secular and the other eternal. The secular reason is that it draws attention to the need for freedom of religion protected by law. In South Africa we now have freedom of religion protected by law. Before 1994 we did not, and many Christians were persecuted for their faith, both in South Africa itself and in South African-ruled Namibia. The Epinga martyrs were one instance of this. One of the things that arises from this is that the response to instances of violent death can show what values really motivate people. A couple of months ago there was a terrorist occupation of a shopping mall in Kenya. In the same week there were also the bombing of a Christian church in Pakistan, and violent attacks on travellers in Nigeria. The Western media chose to hype the first incident and play down the others, barely mentioning them at all, in spite of the fact that more people were killed in those incidents than in the attack on the Kenyan shopping mall. One is tempted to say that this was because the attack on the shopping mall was an attack on the established religion of the West — Mammonism. People tend to give more prominence to the things that interest them. From the secular point of view, then violence against people because of their religious views, or any other characteristic, is seen as a bad thing. In some countries it has created a new legal category — the “hate crime”. And, if they are fair, such laws should cover xenophobia, homophobia, Islamophobia, Antisemitism and Christianophobia equally. And I think it is right that Christians should point out the evil of such acts of violence and other human rights abuses. But in the light of eternity, Christians have a different approach. for great is your reward in heaven. 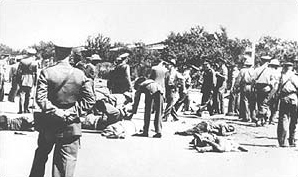 Today is Human Rights Day, and the 53rd anniversary of the Sharpeville massacre, which it was instituted to commemorate. We’ve remembered it for many years, and officially commemorated it for nearly 20 years, but this time it is somewhat different. Ten years ago I was at a commemoration of Human Rights Day in St Alban’s Anglican Cathedral in Pretoria. It was a special thanksgiving service for the completion of the work of the Truth and Reconciliation Commission, and the handing in of their final report on gross human rights violations in the apartheid era. Speaking at that service, Desmond Tutu, the chairman of the commission and Anglican bishop, said that we had come a long way since then. Val and I went to a special service in the Anglican cathedral in Pretoria, to mark the close of the work of the Truth and Reconciliation Commission. We went to Mamelodi to fetch Johannah and Thabitha Ramohlale. Most of the commissioners were there, and several massed choirs sang. Several of the victims of the human rights abuses investigated by the commission were there too, as were some of the perpetrators. Perhaps the most moving thing was when Anglican priest Michael Lapsley sprinkled holy water on the congregation, in silence, using his artificial hands, because his hands were blown off by a letter bomb sent to him by the security police. There were also the survivors of the Trust Feeds massacre, where 11 members of a family were killed. They were accompanied by Brian Mitchell, who led the police who had killed them, and is now working on projects to help the community. Hanging from the pulpit, unremarked, was an embroidered banner, showing a stylised white person and a stylised black person embracing in a gesture of reconciliation. It had been given by Cecil Kerr about 20 years ago, a gift from a group in Northern Ireland that had been working for reconciliation there. And as they passed on their vision for reconciliation, perhaps we in South Africa can pass on ours. Today is a public holiday, known as Human Rights Day, and it is 43 years since 69 people were killed outside Sharpeville police station where they were protesting against the pass laws. As Bishop Desmond Tutu, the chairman of the Truth and Reconciliation Commission said, we have come a long way since then. But this year, following the Marikana Massacre, the thought that we have come a long way since then sounds a bit hollow. We’ve slipped back a long way since that commemoration ten years ago. 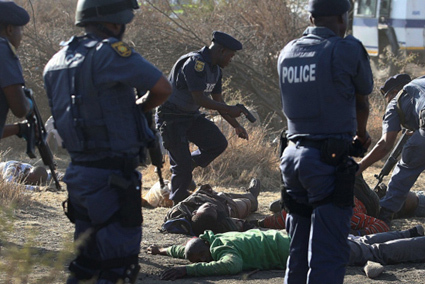 And one thing I’ve noticed is that on the radio government people do not speak about the Marikana Massacre, but the Marikana “tragedy”. Now I hold no brief for the DA (Democratic Alliance, an opposition party). But when one recalls that the people who were killed at Sharpeville were there because of a protest campaign organised by the Pan African Congress, does that mean that only PAC supporters can commemorate Sharpeville? While Cosatu is not a political party, it is in alliance with the ANC, and the ANC opposed the PAC’s anti-pass campaign back in 1960. Today the PAC commands the support of only about 1% of the South African electroate. Are only those 1% allowed to commemorate Sharpeville? Or is it something for all South Africans to remember? Perhaps such sectional thinking is why the way we have come from Sharpeville seems to be growing shorter. Zwelinzima Vavi is one of the people I follow on Twitter because I think he speaks a lot of good sense. 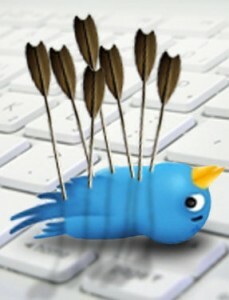 But on this occasion I think he fluffed it. Speaking of Twitter, it is also Twitter’s 7th birthday today, and I see that I joined it on 14 April 2007, nearly 6 years ago. It has probably come a long way since then too, and here’s an interesting article about it. Is an abortion debate possible? Abortion is one of the issues that I have generally avoided blogging about. The reason for this is, as the Opinionated Vicar, David Keen, puts it, that “the heat/light generation ratio is so dire”. The extreme bigotry of both “sides” in the abortion “debate” make it almost impossible to discuss. What I would like is for my fellow lefties and liberals to try to understand and respect the views of those of us who are pro-life, rather than demonise us as right-wing reactionaries or medieval misogynists. One of the biggest problems with the abortion debate is that it’s asymmetric: the two sides are talking at cross-purposes. The pro-lifers speak about the right to life of the unborn baby; the pro-choicers speak about a woman’s right to choose. The moral arguments, as the Scottish philosopher Alasdair Macintyre has said, are “incommensurable”. Another problem is that the debate forces people to choose sides: right against left, religious against secular. Some of us, however, refuse to be sliced and diced in such a simplistic and divisive manner. I consider abortion to be wrong because of, not in spite of, my progressive principles. That I am pro-life does not make me any less of a lefty. I woke up relatively early, and while eating breakfast discussed with Eric an article in yesterday’s “Sun” on the subject of abortion. The thing that struck me was that they spoke of the “liberal and enlightened practice of legal abortion” and “a human approach unaffected by moral attitudes” which sounded completely nonsensical. As they put it the whole thing sounded to me like fascist piggery based fundamentally on the idea that if the existence of another person causes me inconvenience or discomfort then I am morally justified in trying to get rid of the other person. And here the fact that many of the people involved (in abortion) were married women who already had children would seem to indicate a certain amount of selfishness. And once having established the practice that it is all right to get rid of inconvenient individuals in some circumctances, then the way is open for doing it on others. If unwanted babies are to be disposed of in this manner, then why not euthanasia, which could rid society of the mental defective and the physically deformed, and possibly the old people who can no longer look after themselves and so become a burden on society. The practice might be extended to social misfits as well — those who, while having no obvious physical or mental defects, nevertheless fail to adjust themselves to society. Political deviates would be the next on the list. Why, we’ll be back to the good old days when Jews were liquidated in the gas chambers. course a humane approach must not be affected by moral attitudes. course, is an extensive exaggeration of what the article actually said. But such escalation would really be perilously easy. Perhaps there is something in human rights after all; if it were enshrined in law — the illiberal, unenlightened and inhumane idea that every human being from the moment of conception, had “an inalienable right to life, liberty and the pursuit of happiness”. Some time later it occurred to me that they might be using “liberal” in the sense of “permissive”. Liberalising the abortion laws would make it easier for people to have abortions, just as liberalising the gun laws might make it easier for people to own and carry guns. So one might advocate “liberal” abortion laws or “liberal” gun laws, but advocating or opposing such laws might not be a reliable indication of whether or not one was liberal. Dear woman-hating anti-choicers, please go away to those badly written websites with horrible spelling and ridiculously stupid arguments where creatures of your ilk graze, OK? This is a blog for people who have a fully developed adult brain. You are not going to like it here anyways. Strangely enough, I haven’t taken the advice to go away, and actually do quite like it there, because not all the posts are as bad as that one. Liberals are on a never ending futile mission to justify the senseless slaughter of innocent children. They claim that Abortion just kills a clump of cells, not an actual human life. Yet pictures like these tell a very different. Liberals want to rationalize what can and will not ever be rationalized: that killing babies is not Murder. Liberals: Responsible for the biggest holocaust of our modern times since Roe Vs Wade. So having learnt from opposite extremes on the spectrum that I am a woman-hater who lacks an adult brain and that I am responsible for the biggest holocaust of modern times, what can I say? They are not talking about apples and oranges, which at least are both edible fruit; they are talking about chalk and cheese. The issue of abortion has galvanized more passion, on both sides, than any other issue in the area under consideration here. This should not be surprising, in view of what is at stake here. For the one side, what is at stake is the fundamental right of a woman to have control over her own body and her own life. On the other side, what is at stake is the very purpose of society in protecting the life of even its weakest member. Clearly, there is an enormous cognitive gulf between the two sides, in terms of the understanding of the nature of the human person: Is the fetus a person, yes or no? This is a cognitive issue, logically prior to any discussion of norms, for the norms of each side, one may assume, would be readily acceptable to the other side, provided the cognitive issue were resolved: The most ardent pro-abortionist does not recommend infanticide in the exercise of a woman’s right to control her own life, which presupposes that an infant has a different status from a fetus; and the most fervent anti-abortionists do not dispute a woman’s rights over her own body, but what they do dispute is that a fetus is simply part of a woman’s body. The language used in this debate over abortion has systematically obfuscated this fundamental cognitive divide. This is already apparent in the appellations used by each side to describe its own position: “Pro-choice” versus “pro-life.” Pro-abortionists demand a woman’s right to choose for herself – which only begs the question as to whether, in the case of an abortion, she is choosing only for herself and not also for another human being. Anti-abortionists claim to be defending human life – which presupposes agreement as to when the life of a human individual begins. Both appellations, of course, have powerful emotional connotations. “Choice” is one of the key concepts of modernity, as we have argued elsewhere. Being modern entails a vast expansion in choices and thus in the control of human beings over their own lives. Conversely, to be “anti-choice” suggests a deeply reactionary and obscurantist attitude – a suggestion used to the hilt in pro-abortion propaganda. And “life,” after all, is one of the most potent words in the language. One can hardly say anything worse of political antagonists than that they are “anti-life.” As part of the language battle in this area, it is noteworthy how carefully words are chosen by each side. Pro-abortionists will always use language that avoids suggesting a human status for the fetus; anti-abortionists will regularly say “child” instead of “fetus.” Anti-abortionists, by the logic of their own position, must, then, speak of “murder” to refer to abortion and, in view of the number of abortions now taking place in the United States (more than one million annually), of “genocide.” Little room for compromise would seem possible under these circumstances, and the debates over other family issues seem mild by comparison. I was a Liberal, and joined the Liberal Party because I was a Christian. And the Liberal Party, it seemed to me, advocated political policies that were most in accord with Christian anthropology. That is not to say that the Liberal Party was a Christian party. Many of its members were Christian, but many were Hindus, Jews, Muslims, atheists or agnostics. They might have had a variety of reasons for supporting such policies at the mundane level, and it was at that level that we agreed. 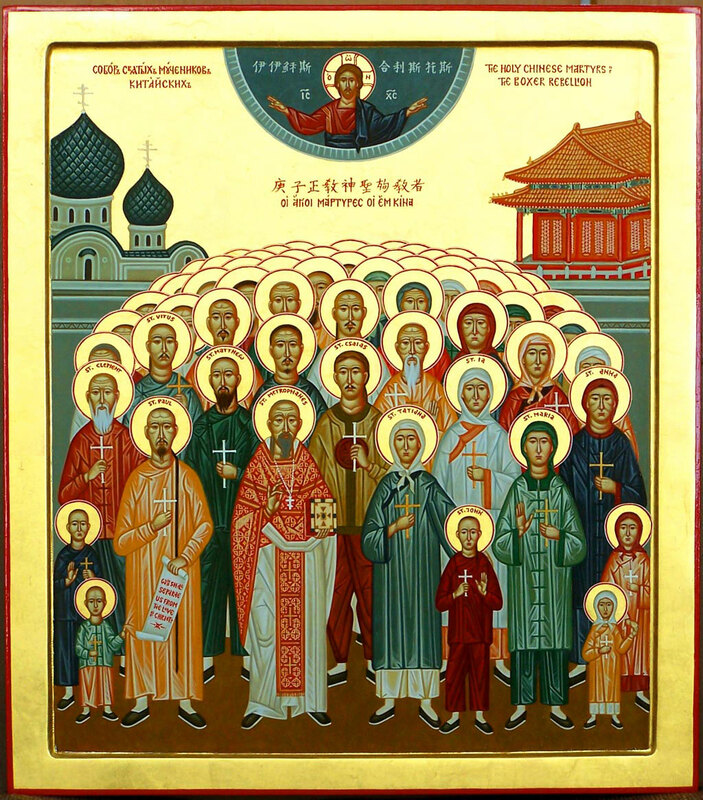 On the question of taking the life of another Orthodox Christianity seems to approach the matter differently from Western Christianity, or from Western secular humanism. In Western thought there seems to be a strand of legalism — the notion that there can be a “just” war, or “justifiable” homicide. In Orthodoxy killing someone, whether in battle or by abortion, is always a sin that needs to be confessed. One cannot say, “I am a soldier obeying lawful orders, and therefore killing the enemy is not a sin, and is therefore justified.” And the same with abortion. Whether it is legally permitted or not, abortion is a sin and to be confessed. But the Church does not exist to punish sinners, but it is rather a hospital in which they can be healed. There is thus a distinction between what is “right” and what is “moral”. It coincides roughly with the distinction between “law” and “gospel”. As a Liberal, I support the concept of human rights because if applied properly, it can help to mitigate the effects of human unlovingness and human sinfulness. Laws cannot force people to love one another, but they can mitigate the effects of human hatred. Justice is good, but Christians are called to go beyond justice to love. At its best, justice is congealed love. An American citizen has many rights. A Christian has none — all he has are invitations to virtue, and the promise of beatitude. An American has a right to bear arms. A Christian may make such a claim, but not as a Christian. I’m sure that a Christian can go hunting and can even keep something for the defense of his home (although that possibility is even less supported for a priest). But I am even surer that a Christian — as a Christian — cannot ever demand the right to possess and traffic in assault munitions. An American has a right to terminate a fetus. A Christian does not. An American has a right to engage in sexual activity outside the contours of a sacramentalized union of a man and woman. A Christian does not. He or she, whether we like it or not, is asked to surrender not only homosexual activity, but also heterosexual activity that is before or outside of traditional marriage. He is requested to devote himself to not only physical chastity, but also to the “chastity of the imagination” — a concept, I’m sure, is not the most popular of positions. An American has the right to accumulate wealth, and to deny comfort to his neighbor and pollute the environment in the process of doing so. A Christian does not. Wealth is given to Christians, as St. Paul and the Prophets and the Fathers make painfully clear, solely for the sake of “kenotic” giving away. It was only the Reformation that made the idea of “wealth-protection” a Christian possibility. And the rest of that post is worth reading too. Forty years ago today the World Court announced its judgement that South Africa’s rule of Namibia was illegal. It happened, most appropriately, on the Winter Solstice. Until then the nights had been longer than the days and getting longer. But thereafter, though the nights were still longer than the days, they were getting shorter. It was to be another nineteen long years before the last South African troops crossed the southern border, and Namibia heaved a collective sigh of relief. The longest night was still the longest night, but for the first time it gave real hope, hope that the dawn was getting ever closer. Nothing changed, yet everything had changed. Here’s what I wrote in my diary at the time, for what it’s worth. Perhaps I should explain, by way of background, that I was at the time a self-supporting priest in the Anglican Church in Windhoek and worked at the Windhoek Advertiser as a proof reader, and that Deve de Beer (who also worked for the Anglican Church) and I were stringers for the Argus Africa News Service, which fed most of the evening newspapers in South Africa. Mudge, the acting administrator, also made a plea for calm. At lunch time I went to the court, and saw Chris Nicholson there. He said he had heard on the radio that the World Court had decided by 13 votes to 2 that South Africa had no right to be in South West, and thought it would be interesting to see who the 2 were. It would be a guide to the impartiality of the court. If they were British and French, it would show that national self-interest dominated the proceedings, rather than a real concern for justice. We carried the story on the front page of the Advertiser, and Cowley wrote an editorial about Bantustan presidents or leaders going overseas to do a power of good to the homelands policy. Jimmy [Jimmy Simpson, the subesitor]was bitter about the World Court, and said it looked like his fishing would be over. When I asked him why, he said, “Well, with the United Nations taking over”. I don’t see why the United Nations will prohibit Jimmy from fishing, but he seemed convinced they will. I gave Dina a lift to Katutura, and ran out of petrol. I asked her what she thought about the World Court decision, and she said she didn’t think. But she asked all sorts of questions, like what would South Africa do, what would happen if they pulled out, and would they really pull out. When I got to Clemens Kapuuo’s shop there was a group of men standing outside, Mbuende among them. Mbuende introduced me to the others, who were Herero councillors from Aminuis. One of them burst out “We are so glad about the World Court decision that our country is ours”, and there were great smiles all round. Mbuende said that Kapuuo was not at home, but had gone to Omaruru. I asked if any of the councillors was prepared to make a statement, but they all wanted to wait until Clemens came back. not a leader like Clemens Kapuuo. I took Mbuende back to the diocesan office to see the bishop, and arranged what was to happen about the Herero church conference, but the bishop and Dave had gone to see pastor Reeh. We spoke to Clive Whitford who said we could quote him as saying he was “overjoyed” by the World Court decision. He said I should attribute it to “a white professional man” and not to a “teacher”, since he and Chris Roering were the only teachers (white) in town who could possibly make such a remark. I took Mbuende back to Katutura, and started writing stories for the Argus Africa News Service, which we went to put in the telegram box at the post office, and returned to listen to Vorster’s speech on the radio at 8:00, which was predictable enough. It was funny to hear a man who bends the law to suit his own purposes complaining that others were doing this. The fact that it was the British and French judges who dissented might lend credence to this, because it was their national self-interest that was at stake. apartheid, no more homelands, only one homeland for all, one nation, one Namibia. He went on for half an hour, cataloguing his objections to the contract labour system, saying Vorster’s speech on the radio was hypocritical, and when I asked him what he thought of Clemens Kapuuo, he said Swapo respected him as an honest man who spoke for his people; unlike Ushona Shiimi who was a stooge, a puppet, a tape recorder, who repeated what he was told to say. That, I thought, was true, but nobody in their right mind could take Ushona Shiimi seriously, or think he spoke on behalf of anyone but the South African government. I have not met a single Ambo who does not think Ushona Shiimi is a big joke. After the call ended, I wrote out his statement, or the relevant bits of it, and Dave wrote a description of Windhoek at lunch time, and then we dumped those in the telegram box too, and then went off to have a drink at the Berg Hotel to celebrate, and went home to bed.